I'm so excited my Ultimate Thailand Travel Guide is ready for all you lovelies! Getting this together was a labor of love as I literally had to go through thousands of photos to curate this travel guide for you all! My trip was in the month of December, and lasted a week and a half, with roughly 5 days in Bangkok, 3 days in Phuket, and 1 day in Ayutthaya. I've broken down my trip to the different locations I've gone too, including where I stayed, must-do activities, and places to eat. Hope this Thailand travel guide will inspire you to take a trip to Thailand. I already can't wait for my next trip there, as I have so much left to see! We stayed in Bangkok for around five days. This bustling metropolis is full of rich culture, amazing and flavorful food, giant megamalls, floating markets, beautiful temples, Thai massages, and so much more. I definitely recommend staying in Bangkok for around 3 to 5 days. Below are my favorite activities from the city. To see a list of amazing places to eat, scroll down to the section "Food in Thailand." While I wasn't able to take pictures to show you, I definitely recommend getting a Thai massage (or two) once you're there too! Wat Phra Kaew is the most important Buddhist temple in Thailand. When visiting the temple, make sure to wear long pants or a long skirt as they enforce a strict dress code. They also have pants to rent for a small fee. The Grand Palace has been the royal residence of the kings of Siam since 1782. 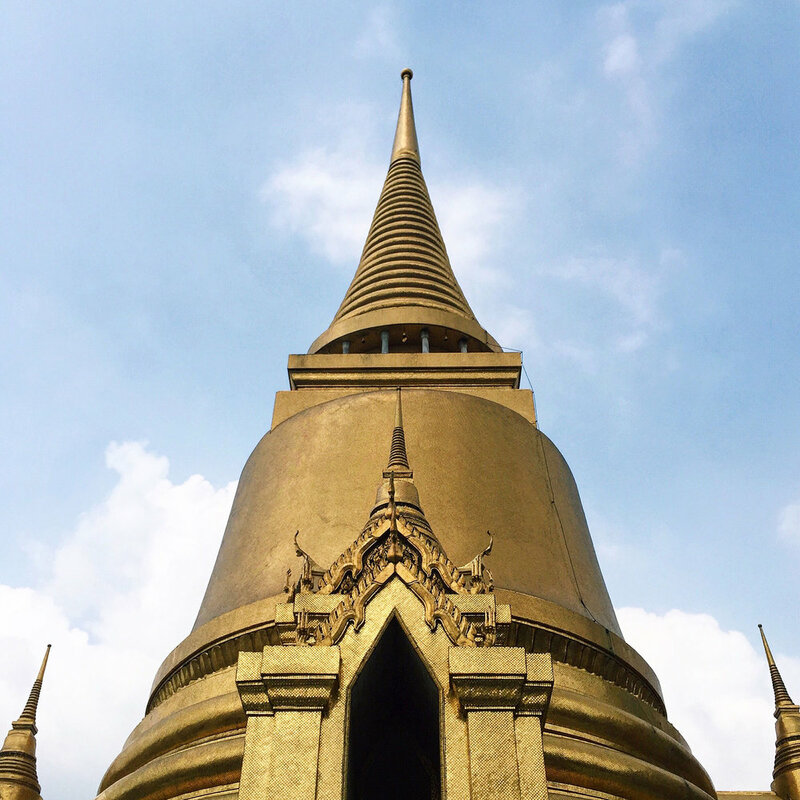 The intricate and beautiful Thai architecture makes it the most famous site in Bangkok. Street food is the bomb in Thailand. Go to the booths where lots of locals are hanging out! Khao San Road is a popular street to shop and get food! The floating markets of Thailand are a must see. Fresh produce, souvenirs, fresh grilled seafood, and more are sold from boats floating by on the river. Scroll down to the section on Taling Chan Floating Market below to see more! 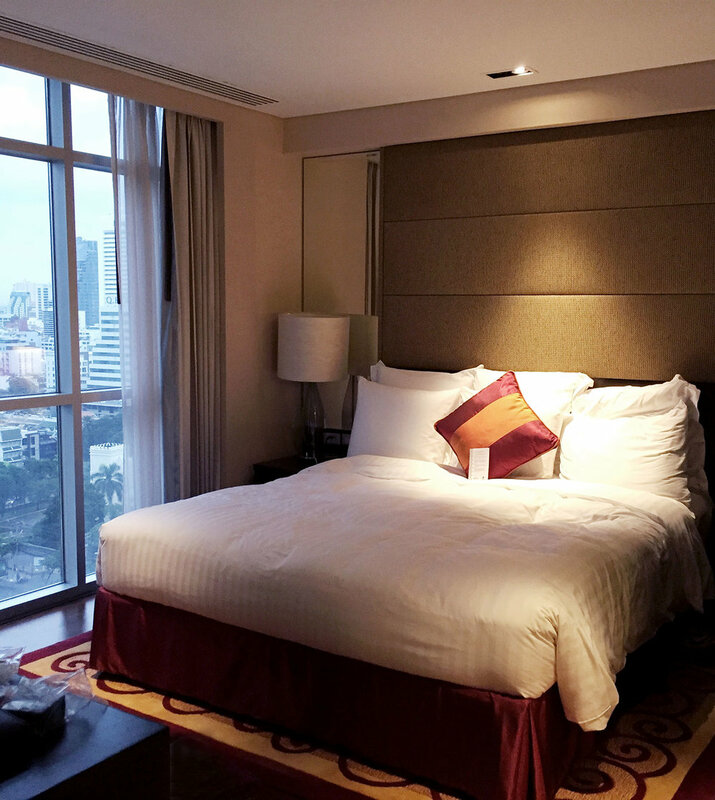 The Sathorn Vista suite apartments is where I stayed with a group of friends in Bangkok. This 5 star hotel was perfect for us, with its lovely views, location in the business district, and spacious layout. Chatuchak Weekend Market is a fun place to shop. They sell everything from clothes and accessories, souvenirs, home goods, furniture and antiques, and street foods. Check out amazing views while sipping on yummy cocktails from the 61st floor of the Vertigo Rooftop Bar! Bangkok is one of the shopping capitals of the world, and a trip to Bangkok isn't complete without visiting the plethora of megamalls, from high-end to affordable. The lounge area at Avista Hideaway Phuket Patong by Sofitel. Phuket is an island on the southern end of Thailand, and is known for its beautiful beaches, amazing resort hotels, bustling shopping and nightlife, and its proximity to the Phi Phi Islands and Phang Nga Bay. We stayed for 3 days and it was a blast. I totally recommend staying at the the Avista Hideaway Resort, taking a snorkeling tour with Offspray Leisure to the Phi Phi Islands, and checking out all the amazing beaches! Check out our favorite activities below from our trip there! Paradise Beach is a private beach you can visit and pay 100 baht to enter. It's totally worth it as it allows you to paddle board, kayak, and use their amenities once you're in. It's a beautiful beach with a nice restaurant and bar, and more privacy. Other popular beaches include Patong, Kata, Karon and Kamala. Zorbing at Rollerball is a super fun activity where you can roll down a hill inside of a giant plastic ball partially filled with water. It's absolutely crazy tumbling down a hill inside of a ball. Pay based on the number of rolls you take. While I am too scared to try this myself, our friend Danny went bungee jumping at Phuket Jungle Bungy Jump. Try it out if you're a daredevil! If you visit Phuket, you have to take a snorkeling day tour with Offspray Leisure. Scroll down to the section below on the Phi Phi Islands for more information! Bangla Road is the hub for all things nightlife in Phuket. By day you can shop and go to restaurants, and by night it really comes to life with pubs, discos, bars, clubs, performers, and more. 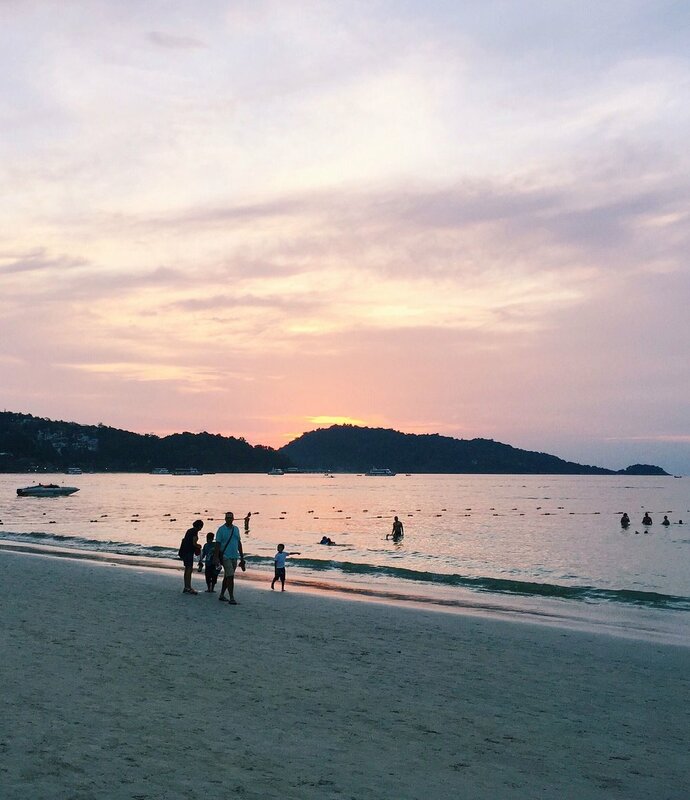 Patong Beach is one of the most well-known beaches in Phuket with lots of shopping, bars, nightlife, and restaurants because of it's proximity to Bangla Road. It's a touristy beach, so if you don't like crowds and noise, check out Paradise Beach. This is a view of one of the restaurants at Avista Hideaway, the 5 star resort we stayed at in Phuket. We loved the beautiful rooms, the amenities, the pools, the buffet, and the excellent service! We ate from the outdoor food courts and street vendors several times a day as we couldn't get enough of the fresh seafood. I'm salivating just looking at these pictures! Sporting a cut out bikini in the Phi Phi Islands. Check out the whole look here! If you take a trip to Phuket, you need to visit the Phi Phi Islands as well! We took the snorkeling day trip to the Phi Phi Islands by Offspray Leisure. You embark on private boat from Phuket and take several stops at the different islands, including Monkey Beach where you can actually see monkeys living. You can snorkel at your leisure and see beautiful, tropical fish. The water is so warm and clear, and the color is such a beautiful shade of aquamarine blue! Ayutthaya is about a one hour trip from Bangkok and is a must-see stop on your Thailand trip. The Historic City of Ayutthaya is a UNESCO World Heritage Site and was once the capital of Siam until it was burned down by the Burmese. It's situated on an island surrounded by three rivers, and consists of archaeological ruins of Buddhist temples, monasteries, and palaces. Some of the most famous sites to visit in Ayutthaya include: Wat Phra Si Sanphet, Wat Mahathat, Buddha in a Banyan tree (at Wat Mahathat), Wat Phra Ram, Wat Ratchaburana, Wat Phu Khao Thong, and Wat Chaiwatthanaram. Directions from Bangkok: We took a bus to Ayutthaya which was convenient. Book tickets here, and more options here! Getting Around: Renting a bike or motorbike for a few hours is the easiest way to get around. 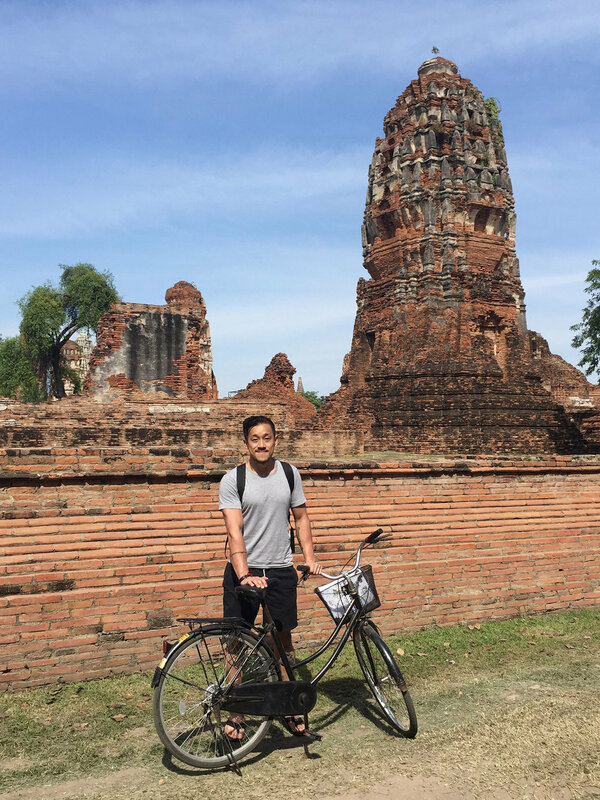 Once you're in Ayutthaya, renting a bike is a fun way to go from site to site. There are so many temples and ruins to see! One of the most famous sites at the Buddhist temple Wat Mahathat is this Buddha head in a Banyan tree! I was wearing a crop top under the tank but I had to cover up (for modesty) in order to see all the temples. 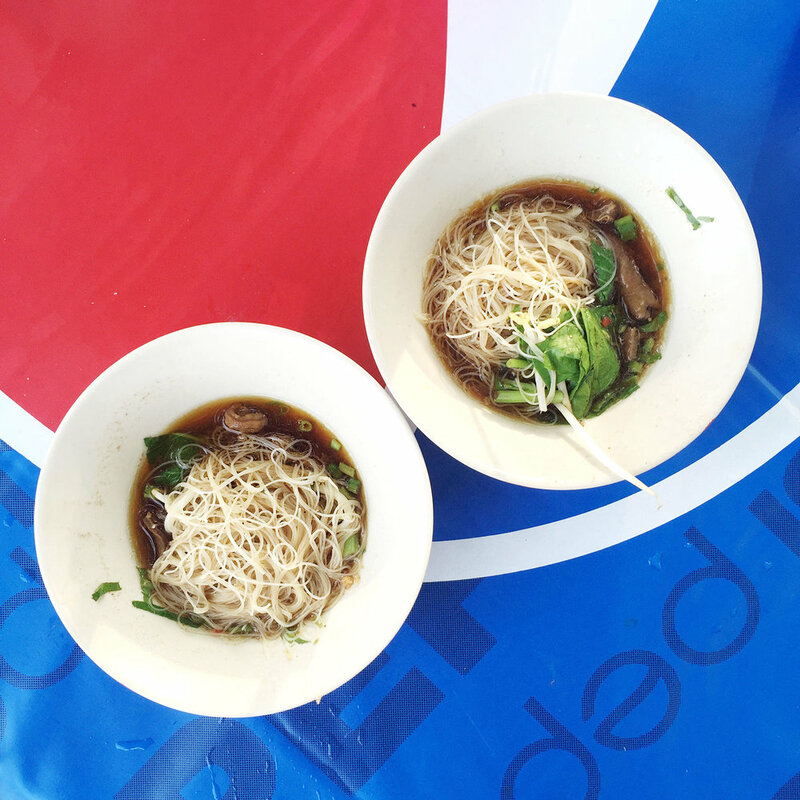 You must try boat noodles when you visit Ayutthaya. They're literally made on a boat! Love the beautiful fruit arrangements on the boats at Taling Chan Floating Market. Fresh seafood and meat is roasted directly on the boats. Freshly roasted seafood and ingredients by the river. Fruit and vegetable shaped little desserts called Luk Chup. Thailand is known for their bustling floating markets. Imagine waking up early in the morning and picking up your daily groceries from a lady selling fruits, vegetables, seafood, and more while on a boat. It's truly a unique and fun sight to see. We decided to go to Taling Chan Floating Market as it's a quick cab ride from Bangkok, and it's less touristy than the most famous markets like Damnoen Saduak Floating Market. It's a great day time foodie trip. Check out the boats with their colorful wares, snack on street food, and buy souvenirs. Thai food is one of my favorites and I was so excited to go to Thailand because of it! I tried everything from grungy street food, noodles made on a boat, to coffee shops, brunches, and fine dining. I've selected some of my favorites below to give you foodie inspiration for your trip there! Toby's is a cute brunch spot with a bright and lovely interior and the prettiest lattes, drinks, and breakfast foods! Thailand is home to the cutest dessert cafes. If you love cute coffee and dessert culture, Thailand is the place to go! 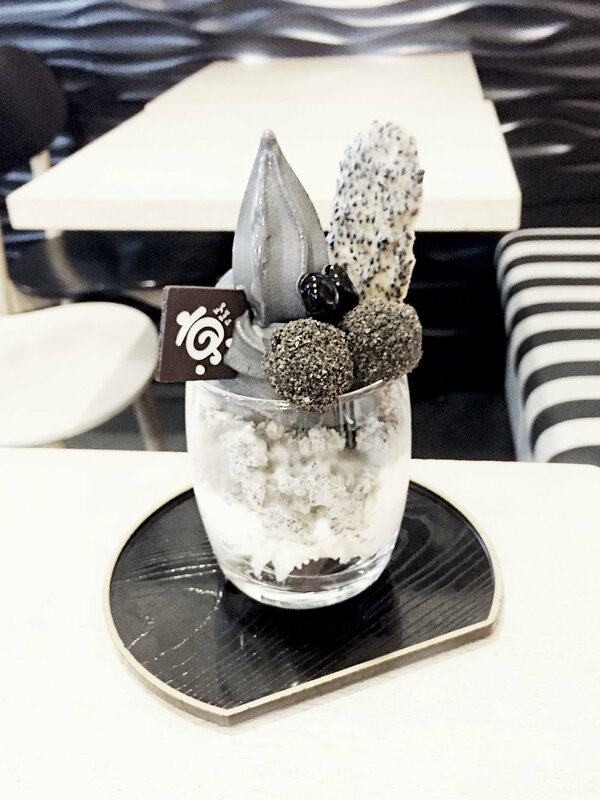 This is the black sesame ice cream from Kyo Roll En! 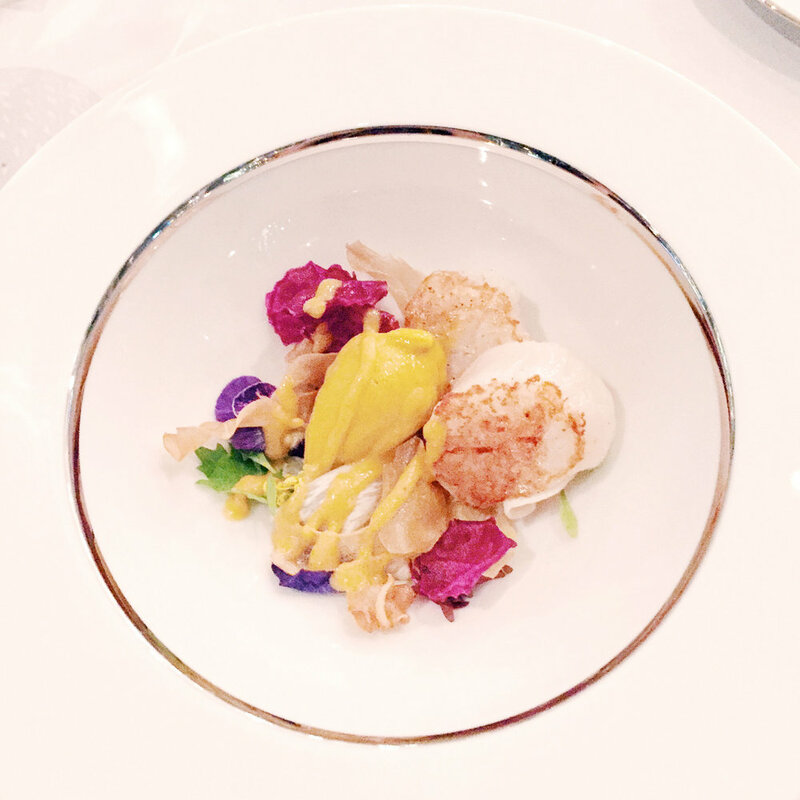 For an amazing fine dining experience, try the 8 course menu at Savelberg. The food, plating, ambiance, and service were all next level! If you love fresh seafood, Seafood Market & Restaurant is the place to go. You pick your seafood and how you'd like it cooked. Our favorites were the lobster and the curry crab! Beat the heat and try the yummy coconut ice cream with traditional Thai toppings while shopping! Rocket Coffee Bar is an amazing chain of coffee shops with amazing coffee, pastries, food, and beautiful interiors. Karmakamet Diner was our favorite brunch experience in Bangkok. The food was absolutely amazing and the interior and shop is a must-see. Try the pancakes, pastas, and the giant cotton candy! 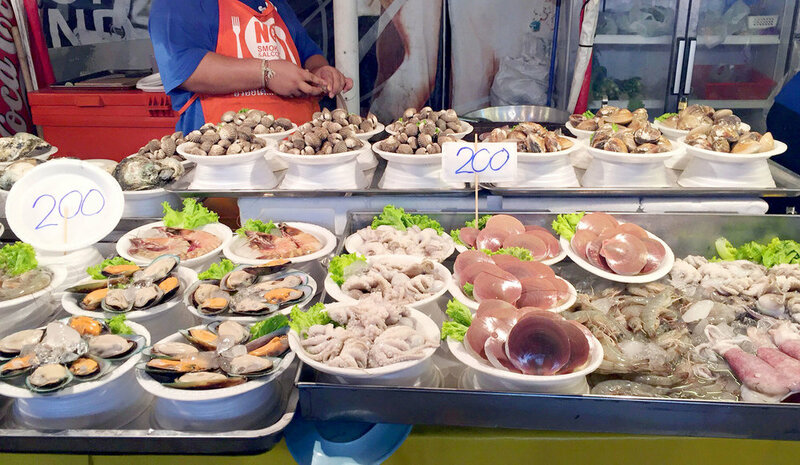 A trip to Thailand would not be complete without getting your fix of delicious street foods. Try amazing street foods on Khao San Road in Bangkok, or Bangla Road in Phuket!